Carolina Shrugs by Cyndee Tovsen - the Designer Wrap with Attitude! Accessories are certainly an important part of every woman's outfit.... the shoes, the jewels, the nails, the hat, and of course the shrugs, or wrap, or scarf and the purse. 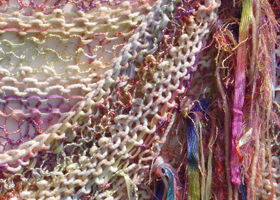 Cyndee uses her designing eye to create great-looking, handknit pieces using fantastic fibers. Many color combinations are available. If an item is sold or you can't find the exact colors, please email/call us to re-create, or create something for you. One of the most recent additions to a woman's wardrobe has been the shrug or wrap. We call our creations "Shrugs" or "Wraps", as they are generally somewhat smaller than a traditional shawl. They encircle the back and arms nicely without being so huge. The body of the garment and the hand-knotted fringe are generally light enough to be warn in any season, with most any style of outfit and add a feeling of warmth when pulled tight. Wear them with jeans or dresses and heels! They are a conversation piece for all who see them. The shrugs are made of a variety of luxurious yarns and did I mention the hand-knotted fringe? A scarf draped around your neck is a sign of nobility. Who else could possibly afford such luxuries? Well, of course you can! Our scarves are very affordable and come in a ba-zillion combinations. So, look around and find one to go with your outfit. What other object is responsible for holding your STUFF so well? Might as well give that purse some credibility and class! See our lovely bags for some cool accessories. Look for a collection of items at the Greensboro, North Carolina Gallery Gift Shop. N. C. Crafts Gallery features the best selection of North Carolina pottery and crafts from across the state. The North Carolina Crafts Gallery is a favorite for locals and tourists alike. The Crafts Gallery, which is located on the corner of Weaver Street and West Main Street in Carrboro offers a wide assortment of items handcrafted by North Carolina artisans. Collections of comfort for your earthly visit!